The Sufferettes: The Sufferettes 2014 Tour of Toronto! 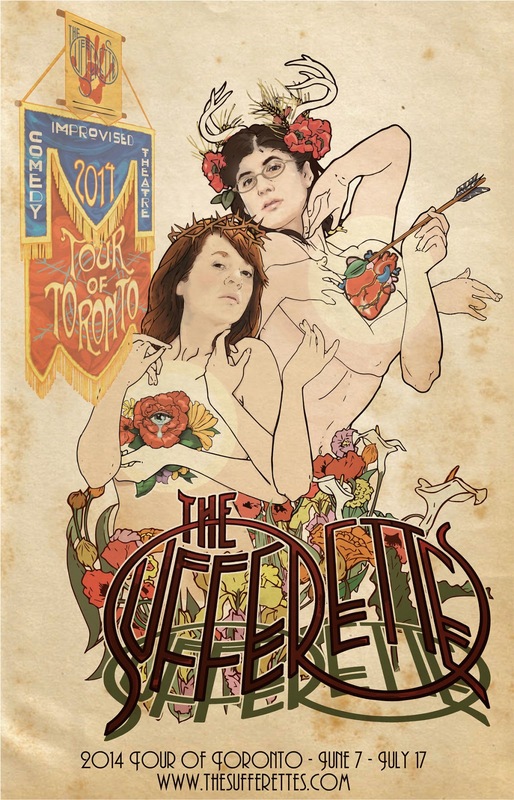 The Sufferettes are on the verge of launching our 2014 Tour of Toronto. After years of spending our springs touring overseas, we have decided to spend this year at home and finally visit all the wonderful comedy shows (and more) in our fair city. Included in the tour are shows we have never done, some classic favourites and a little mutli-disciplinary action. Like what? well, we are designing a set for Trampoline Hall, screening videos at festivals and even interacting with archival video at our VideoHag show at VideoFag. We also doing shows in various neighbourhoods and even a couple wherein you can come up on stage and do scenes with us! We are very excited to adventure through our own city as we have through others and hope that you will all come join us. It's a great way to check out this amazing amount of comedy in this city. For the full tour listing (which, yes, continues to evolve and grow) look here.